Wine and Pop: Community: "Basic Human Anatomy"
Last week I dubbed “Intro to Knots” the best episode of the season thus far and expressed doubt that any of the remaining four would be able to surpass it. I was dead wrong. “Basic Human Anatomy” was simply wonderful. Just like “Intro to Knots”, “Basic Human Anatomy” had a great setup and a fun-filled second act. However, whereas “Intro to Knots” faltered in its conclusion, “Basic Human Anatomy” absolutely excelled. Every element in this story was utilized to its full potential and the central storyline eventually culminated in a particularly poignant moment with a heartfelt message. And, to top it all off, the episode was hilarious. Installments like this are exactly why Community is a show worth watching, even if the show can be hit-or-miss more often than others. The central issue of the episode began when Shirley asked Troy and Britta what they were doing for their one year anniversary, an event the couple wasn’t even aware was coming up. The couple attempted to compensate for their ignorance by making a last minute date, but a happy ending simply wasn’t in the cards for them this time around. Prior to this episode, I had been wondering where the writers were planning to take this strange relationship, as they had not done much to make us care for it. Turns out, however, that the decision to make their relationship noticeable but not lovable was at least effective (if perhaps not intentional) in setting up the conflict within this episode. Just as we were never really sold on the relationship, neither was Troy. In a seemingly unrelated event, Troy and Abed decided to commit to a bit about switching bodies (as seen in Freaky Friday). Originally, I thought the bit was simply going to be another humorous component of the episode, but it ended up being the most important aspect. Troy was in fact using the body-switching bit to avoid having to deal with the fact that he no longer wanted to date Britta and the consequences that that would bring. Eventually, however, Abed (pretending to be Troy) could not help but open up to Britta about how the actual Troy was really feeling about their relationship. It was at this moment that Britta realized she and Troy were over. Meanwhile, Troy (pretending to be Abed) seized an opportunity to open up to Jeff about why exactly he no longer wanted to date Britta and why he was too afraid to break the news to her. In one of the more genuine Winger speeches to date, Jeff explained to Troy that he should simply feel proud about the fact that he was able to put himself out there and commit. And, while it certainly would be difficult, Troy owed it to Britta to end things the right way. It was a particularly poignant moment that tackled a real, personal issue (having to find the courage to break up with someone you care deeply about) in a heartfelt and convincing manner. Moments like these are hard to find in Community, but when the show finds something real to say like this and pulls it off, it’s pretty amazing. In addition to the Troy and Britta breakup, the other elements of this story were expertly crafted to both enhance the central story and create humor at every turn. Jeff, determined to get a passing grade on the final history project and graduate on time, found his goal impeded by Troy and Abed’s bit. 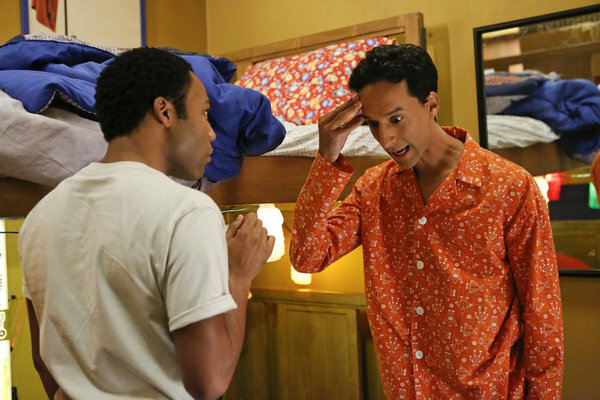 In order to overcome this obstacle, Jeff eventually humored Troy by searching with him for a missing DVD that would supposedly return Troy and Abed to their original bodies. While it was nice to see a determined protagonist go after what he wants, the true value in Jeff’s storyline this episode was his function in aiding Troy to realize what he had to do. As previously stated, his speech to Troy was particularly heartfelt and engaging. On a more unrelated note, tension continued to grow between Shirley and Annie concerning the title of valedictorian. Now in second and third place (respectively) in the competition for the title, the two teamed up to take down Leonard, now first in line for the title. They enlisted the help of the Dean, who was busy pretending to have switched bodies with Jeff. It was one of the more clever situations come up with this season and Jim Rash (the actor who plays the Dean) did a wonderful job with it. Even funnier, however, was Annie’s uncontrollable attraction to the Dean’s imitation of Jeff’s personality. Ultimately, Shirley, Annie and the Dean were able to push Leonard out of the picture, but Shirley and Annie were then left with the knowledge that they had to continue battling each other for the title of valedictorian. While this issue was wrapped up by episode’s end with Annie giving Shirley a temporary congratulations on her position as most likely to become valedictorian, I’m very much hoping this issue will continue to surface in the final few episodes. Pierce was funny! He also helped wrap up the group’s collective goal of making banners for their history project, which was nice. Still not sure why he’s a main character other than the fact that it’s Chevy Chase.